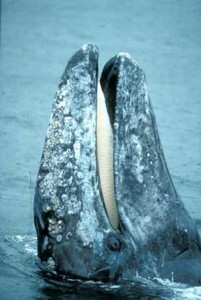 Gray Whale in Puget Sound. Photo: Port of Everett, WA. In my last post, I wrote about amazing places to watch whales. Not long after that, a friend in Edmonds, Wash., shared stories and photos on Facebook of a straggling gray whale that’s been swimming around in Puget Sound, separated from its pod migrating northward to Alaska. Observers say the whale looks emaciated, and local residents, delighted by the unusual sighting, are pulling for the youngster to rally. What is it about whales that touches us so? Nearly anyone who’s been close to one knows how moving these great gentle mammals are. People describe their encounters with words like “magical,” “mystical,” even “life-changing.” Whales’ intelligence is well known, and their communication abilities are remarkable. 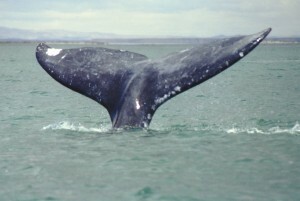 Remarkably, the Obama administration endorses the move, with officials contending that the IWC deal would be a “step forward” for whales because it could rein in Japan, Iceland and Norway, which have killed thousands of whales since 1986 by exploiting loopholes in the current whaling ban. But this proposal is NOT a backdoor route to the end of whaling. It has no provisions for any reduction in 10 years. What this proposal will do is expand the slaughter of whales by re-opening commercial whaling for the first time in more than two decades. Would you join me in taking time to write to President Obama to remind him that he vowed to strengthen the international ban on commercial whaling? Would you ask for his leadership in creating a new proposal that will protect whales? The world needs a plan that will completely phase out commercial whaling, close existing loopholes, end the trade in whale meat and products, and address the many other threats to whales that include climate change and ocean pollution. At a moment when our Gulf of Mexico is becoming a cesspool of toxic oil, destroying habitat and killing thousands of pelicans, dolphins and sea turtles, I can’t imagine willfully choosing to expand the killing of whales. Thanks for taking time to think about this issue, and, if you share my concerns, to respond. And on a happier note, get out there and see these bodacious beauties on one of Nat Hab’s trips to whale territory.